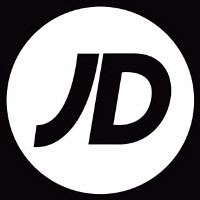 About three weeks ago I wrote a post about the Nike Blazers that I had received from JD Sports and what exactly was in the box. I have been wearing them quite a bit since receiving them, so I thought it was about time that I told you all exactly what I think about them down to the look, comfort and wear of them. 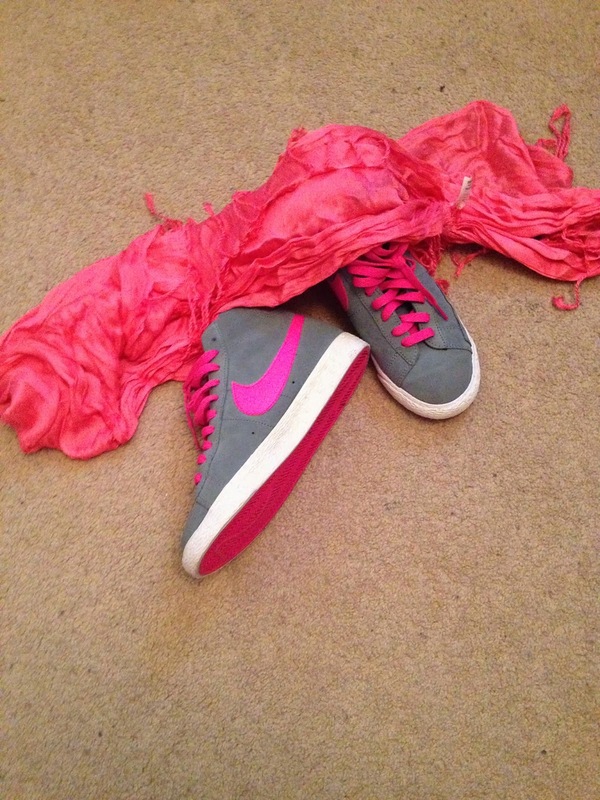 JD sports stock a big range of Nike sportswear but the Blazers were something I have been lusting over for a while. 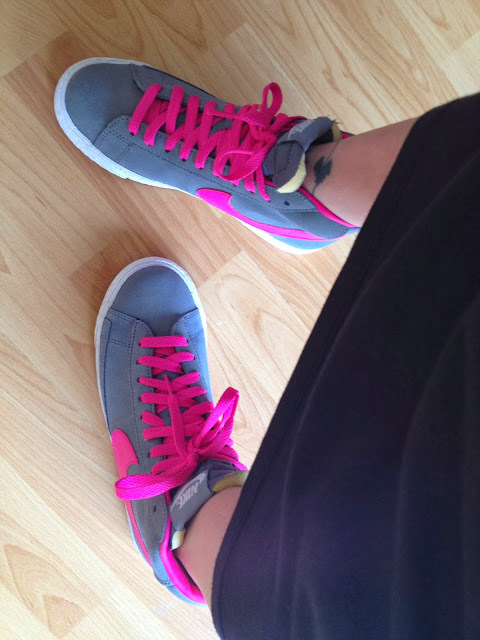 With me having such small feet, I was actually able to choose a pair from their Junior range. The grey and pink foil option that I went for costs a very reasonable £47. These trainers are made with a grey suede upper and a white vulcanised midsole. The added bright pink foil signature swoosh tick makes them pop and the bright pink laces add that finishing touch. Looking stylish yet fun. The Blazers themselves were originally released as a basketball shoe in 1972 and they are that iconic that the design has never changed. I am a size 4 and I have to say these are very true to size. Once on they are super comfy, snug without being too tight. I think they are slightly wider than some trainers so would appeal to a wider range of people. I did find getting them on initially slightly tricky, I think more because they come higher up the leg than most trainers. So I did have to loosen the laces quite a bit to be able to place my foot in without squeezing them on. 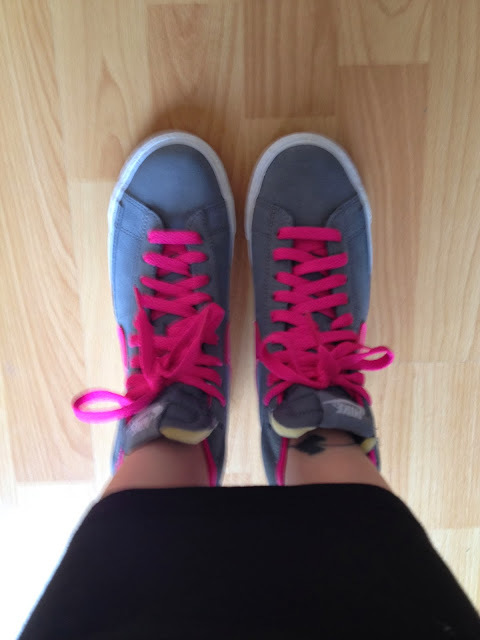 However once on for the first time, as I tend to keep my laces lose anyway, I found it very simple to put on and off. I have walked around these for hours at a time and not once have they given me blisters. I was actually expecting them to rub around my ankles for the first few times but the soft material has meant that they have remained comfortable at all times. These lovely trainers even had the misfortune of getting caught out in the rain on a couple of ocassions and they really held up well. No soggy feet for me and the material dried without leaving any marks. I think what really won it for me was the the pink swoosh and laces matched my favourite scarf, all you ladies know accessories are a must!!! Overall I really would definitely recommend these trainers. They seem fairly hard wearing, extremely comfortable to wear and not overly expensive to purchase. As with other Nike products, you can tell these are made to highest quality and I don't think they would ever go out of fashion. Disclaimer : These trainers were sent to me free of charge for reciewing purposes however all thoughts and opinions are my own.